Just an example of where my remodeling budget came to a grinding halt! I would have loved to update my 50's pink beauty parlor with some of that $1.50/sq. ft. Home Depot slate tile, but I just couldn't justify the time and expense for this neighborhood. I would have had to replace the custom vanity and sink and quite possibly the window. For now I've simply changed the light fixture from Hollywood lights to frosted glass and brushed nickel, swapped the broken metal knobs for crystal, and added a watercolor painting, white-on-white shower curtain, and fluffy white towels and bath mat. Don't tell the guys, but I secretly enjoy all the pink! Next week: how to build a "man room" and why it is essential for your marriage...and for resale! I love that bathroom! I wouldn't change a thing! This is my grandmother's bathroom (also in your state) down to the heat register cover! Melissa, what I meant by "in this neighborhood" is that ALL the homes in my neighborhood have these 50's colored tile baths. In some other areas of town, which are hotter renovation markets, a pink bath might be a major detraction. But people who would be choosing my neighborhood are not necessarily looking for the latest in bathroom styles, but a well-kept, updated home in a family-friendly neighborhood. Plus, almost everything else on the house is already renovated, so if a young couple buys it and wants to do a little work on their own, one bathroom is a do-able, not-too-expensive tiling project. Let's hope so, anyway! One of my friends rented an apartment just because it had a pink fridge...you never know. 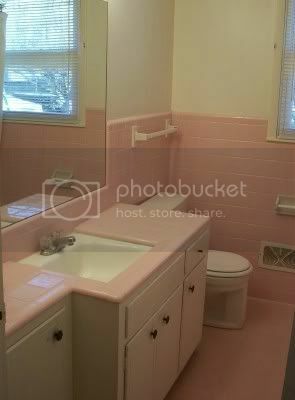 I'm sure that somebody would LOVE to have an all pink bathroom! I can't wait to hear about the "man room." I think my husband needs one! How do you determine exactly what your neighborhood is? I mean, how do you know where the hot reno market is, and how do you know that your locale is only interesting to buyers searching for "a well-kept updated home in family friendly neighborhood"? I'm not trying to be provocative. You certainly must be using some kind of data to make your decision.... Such as: ? Well, Debbie, I go to a lot of open houses. I look to see just how much renovation has been done and how aggressive the pricing is as a result. I try to follow how quickly certain homes go under contract. I watch ads in the newspaper and on the real estate search engine for my area. I mainly try to keep my finger on the pulse of the market. Generally, the neighborhoods closest to the center of our city are the hotter renovation zones--while the quiet suburban neighborhoods like this one--are and traditionally have been more attractive to families. Even though we chose a suburb this go-round, we still chose one in Area 2--which in my city is still the highest-price area. When you pull up Area 2 on the search engine, you will find most homes well above the city average and perhaps only a dozen under $200,000. Forgot to add that this home will be one of those dozen homes under $200,000, which is why we felt it was a safe bet for easy resale. Thanks M. Now the next question: what is a real estate search engine, and how do I find the one for MY city/area? Is "Area 2" a standard designation for a certain type of ... what? I have to laugh at the discrepancies in what $200k will buy between your region and mine. I am imagining your home has 3br, 1-1.5 ba. And a tiled bathroom! pink or not...Couldnt touch it for $200k up here. I toured a home in our price range last week. It was 250 yrs old. Now, while it had some interesting historical value (stop along the Underground Railroad) the attic room looked like a drafty garret from a Dickens novel. The agent assured me this was consistent for the price range. Your pink bathroom looks like a Pottery Barn layout compared to that! Yes, Tennessee's housing market is very moderately priced--although if you're a family on one income, it's still a challenge to find affordable housing in one of the "better" parts of town. Our first two homes were both under $80,000...and were in transitional areas with lots of HUD homes and rentals. However they were both adjacent to very expensive areas with nice groceries, shops, etc. "Area 2" is just a geographical designation for the western side of our city. Realtracs.com is our regional real estate search engine. I think you can go to any of the major realtor chain websites in your own area and find something similar. You are able to enter in your parameters and search the available listings from home. Only a certified agent can pull the entire MLS sheet for you, but you can usually get enough info to narrow your search and do some drive-by's. thanks M! you're extremely generous with your info. I love love love your site. I was not redoing in order to sell, it was going to be my home for a long, long time, but I could not afford to retile the bathroom. I was watching Christopher Lowell one day, and got an inspriration. If you get KILZ, and slap that one first, (with proper ventalation, of course!) and let it dry, then paint on top of it.... you have a new color in the bathroom! I did that, even in the shower, and it has been on the tiles for 10 years. The paint doesnt even have a knick in it. I used white paint to paint the grout lines, but I guess that was more my personal taste than a necessity. So, for about 60 dollars, I got rid of the pink, the tiles were a color I wanted, and it has lasted for the last 10 years, and I dont see why it shouldnt last longer. I wouldnt necessarily doing that if you are planning to sell your home, but for your readers who are looking for a way to "fix" their tile colors without spending the money on tile, it is a great idea! You know, I tried this in the last house. I was not happy with the result, mainly because the once-glossy tiles had a strange, chalky look to them. I suspect it would have been more successful had the tiles been a matte finish. We ended up ripping off the tiles altogether and installing white beadboard wainscoting where the backerboard had been. It was a nicer looking solution for that particular bath, which was very small. I'm glad yours lasted so long--it sounds like a good solution to an expensive problem!